Roll out pre-rolled puff pastry thinly. Add more flour to stop sticking. Coat it with some chocolate spread. 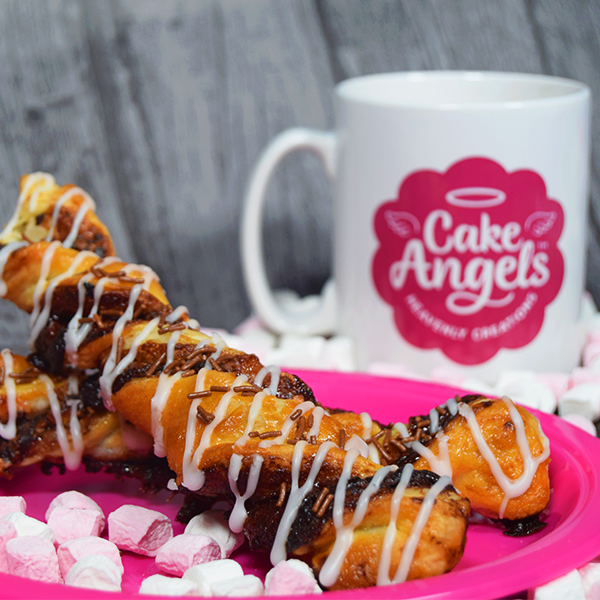 Add Cake Angels Pink & white mini marshmallows and Cake Angels Chocoholics sprinkles. Fold the pastry over in half and pat down. Cut pastry into even sections. Twist pastry into a nice shape and place onto baking tray. Break the egg into bowl and whisk it with fork. Brush on the egg wash evenly. Put in the oven for 10-15 minutes on 200°C. Take out when golden brown. Step 15: Leave to cool.